The Hundred Foot Journey, opening in theaters on Friday, August 8, will have you falling in love with southern France; it will possibly make you hungry as well. The movie, starring Helen Mirren and Om Puri, takes place largely in the quaint and rather breathtaking French town of Saint-Antonin-Noble-Val. It’s a relatively tranquil setting for what quickly becomes an all-out culinary war between the Kadam family and the owner of a French, Michelin-rated restaurant. The Huffington Post’s Christopher Rosen found the movie to be more ho-hum meal than delicious delicacy, but mentioned there were some fine aspects of the movie, including the beautiful scenery. The jury is still out whether this story of culture clash is done with the seasoning of a heavy hand or the pristine subtlety of a master chef. As of this writing, the movie has garnered a 61 percent on Rotten Tomatoes with audiences decidedly more pleased than critics. It’s clear that the actors had a blast making the film, taking in some amazing settings and cooking some delicious fare. To create this kind of movie, you need actors and set designers capable enough to reel in a cynical audience. 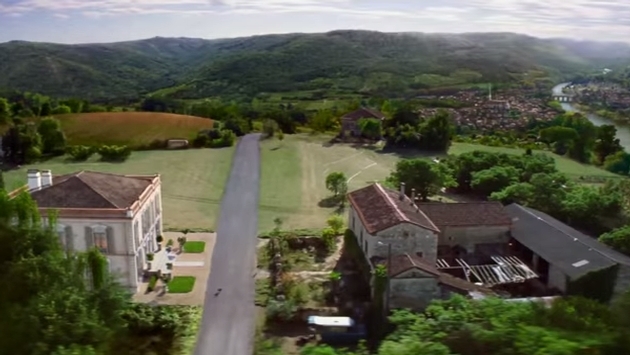 From just the brief glimpse we have had at some of the movie’s scenes, Hallstrom and company painted quite the beautiful masterpiece, utilizing brushstrokes provided by scenery in and around Saint-Antonin-Noble-Val, however you pronounce it.